This post is brought to you by Alamo Wines and Kitchen Play. All opinions and words remain my own. When Alamos wines asked me to create a dish to pair with their Malbec wine I became giddy with excitement. In the realm of popularity, Malbec is for red what Moscato is for white. Malbec grapes grow mostly along the foothills of the Andes mountain range of Argentina. Growing at elevations of 3,000 to 5,000 feet the grapes get tons of sunlight during the day and cool temperatures at night which lends to the wine’s bold, dark fruit flavors. Because of Malbec’s bold layers of flavors and natural acidity it’s a super versatile wine for food pairing, which makes it a perfect wine for entertaining. 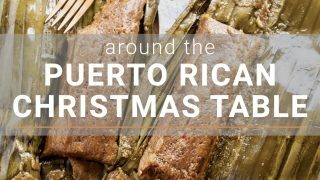 It’s so versatile you can cast those traditional food and wine pairing rules aside and dare to pair with something fun and new! 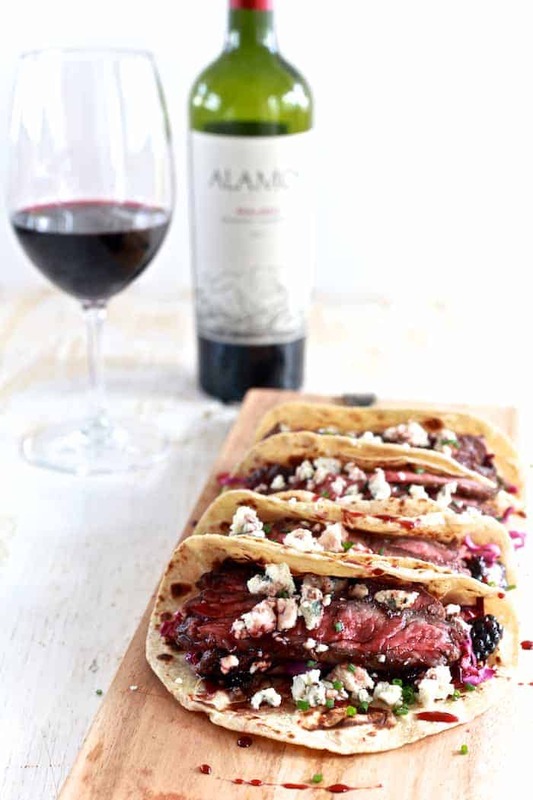 Tacos were the first thing that popped into my head when I was asked to pair something daring with Alamos Malbec. Normally the word taco makes you think of meat topped with cheese, salsa and guacamole and wrapped in a tortilla. When I was a kid, it was all about taco seasoned ground beef in crunchy corn shell. You know…your typical taco Tuesday taco. But, tacos can be so much more then just taco-seasoned ground beef. The taco possibilities nowadays are endless. Who says tacos can’t be fancy and fun? After taking the first big whiff of the wine, I immediately got notes of blackberry and dark cherry, and I knew these were the notes I wanted to play with. I focused in on the blackberry that pairs well will both cinnamon and blue cheese. It sounds a little odd I know, but, stay with me. I decided to rub the skirt steak with a fall spice mixture of cinnamon, nutmeg, allspice and brown sugar. I also added some garlic powder and salt for savory notes and seared it in sage butter until crispy and caramelized. I then made a slaw of red cabbage; radicchio, pears and blackberry tossed in a dressing made with the Alamos Malbec. Wrap it all up in a warm tortilla with blue cheese crumbles and a pomegranate syrup drizzle. Cheers to fancy tacos!! The tacos were amazing on their own, but paired with Alamos Malbec the blue cheese became smoother and the berries richer. Nothing was lost or overpowering, it balanced perfectly. Call it Taco Tuesday for grown ups! 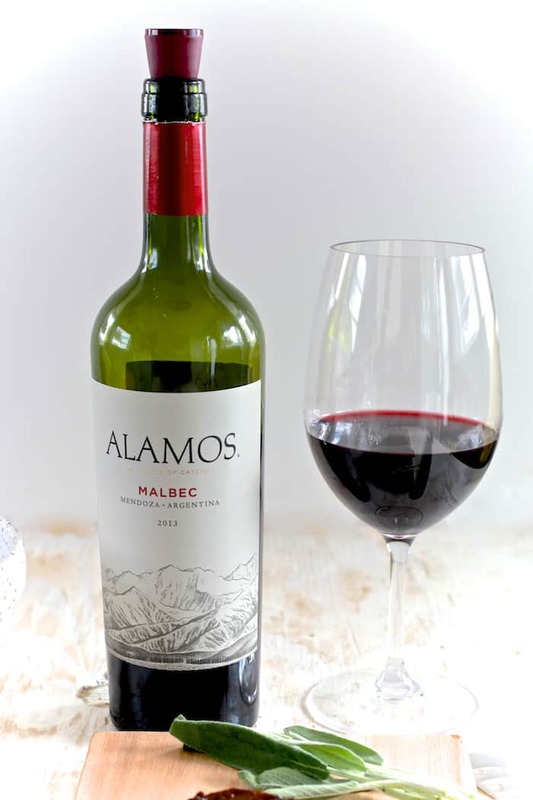 This holiday season, when you are looking for a wine to pair with your fabulous appetizer spread, Alamos Malbec is the way to go. Its versatility makes it easy to pair and a crowd pleaser. Heat a sauce pot over medium-high heat. Combine pomegranate juice, sugar and lime juice. Cook, stirring occasionally, until the sugar has completely dissolved. Once the sugar has dissolved, reduce the heat to medium-low and cook until the mixture has reduced by half, approximately 30 minutes. It should be the consistency of syrup. Remove from the heat and allow to cool in the saucepan. Combine rub ingredients. 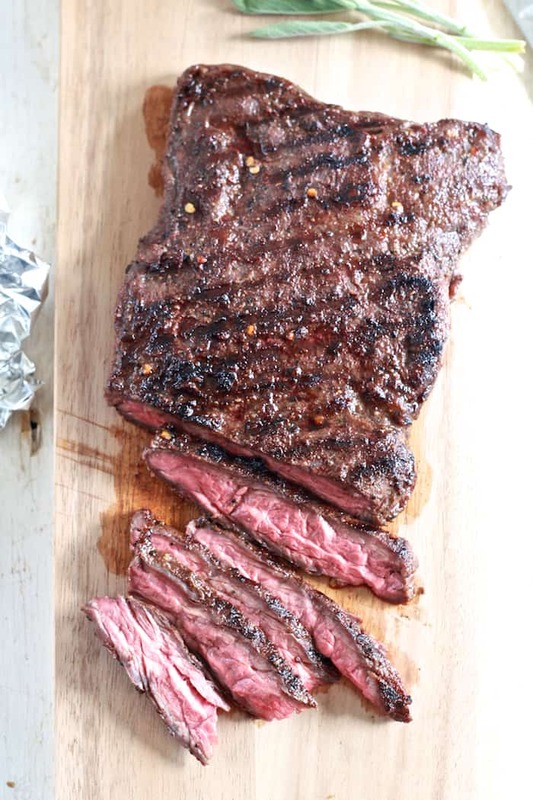 Rub over skirt steak on both sides. In a small sauce pot melt butter and add sage leaves. Cook sage leaves in butter over low heat for about 3 minutes or until aromatic. Brush steak with sage butter. Heat a cast iron skillet or griddle over medium-high heat. Lay steak in hot skillet, it should loudly sear. Cook on each side for 3 - 4 minutes. Remove steak from heat and set aside to rest for 5 minutes. While steak is resting warm tortillas in a dry skillet. Wrap tortillas in foil to keep warm. Whisk together dressing ingredients. Toss slaw ingredients together and dress with desired amount of dressing. Thinly slice steak against the grain. Divide slaw evenly among tortillas, top with sliced steak, blue cheese crumbles and drizzle with pomegranate syrup. I plan to make these and then promptly stuff them into my face…repeatedly! Pinning and stumbling! Love the way you combined tacos from Mexico with churrasco from Argentina. Sounds delish! omg how gorgeous are these??! 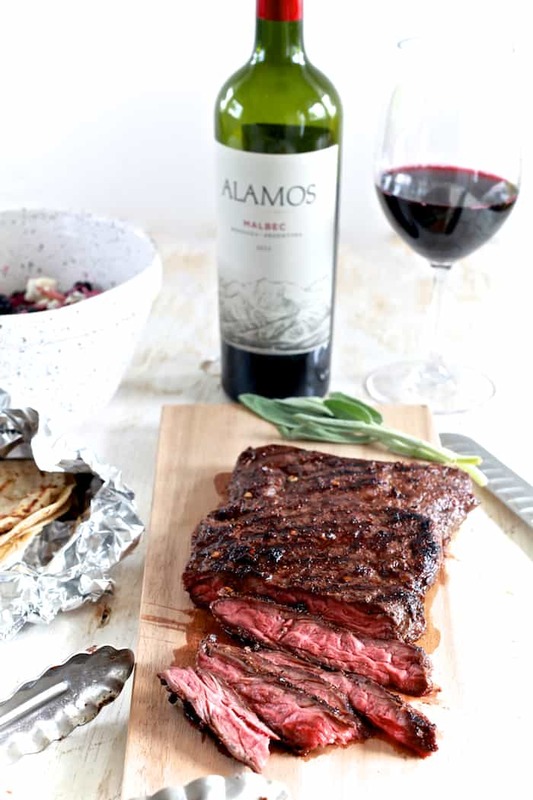 Malbec is my favorite wine and it goes amazingly well with flank steak. These tacos look awesome!! I can never resist a good Malbec! These teak tacos look like the perfect paring, and that slaw sounds fantastic! Oh man. Those tacos. They look out of this world! WHOA! These are THE prettiest tacos on the planet! Ooooh the slaw, too! I LOVE IT! I would like to be your neighbor. Let me know when the house next door goes up for sale because I LOVE your food. That is one gorgeous steak. I’m not sure it would even make it inside the tortillas if it was in front of me. Yum! These tacos look incredible! And that steak…! It’s so perfectly done. And love that there’s wine in the dressing! Yum. This is just brilliant. I love the fancy tacos!! I just fell in love with skirt steak recently so this recipe is happening soon! Holy cow these tacos look amazing! Not exaggerating when I say these are the best looking tacos I have ever seen. I want them all. I really like the flavor combination. I sounds like it would go so well with the malbec. I’d love to dive face-first into those tacos!! Love this recipe! What a great flavor profile — these tacos look incredible! We love skirt steak! Love all the flavors you have in there. Gorgeous char yet moist and oozingly flavorful. 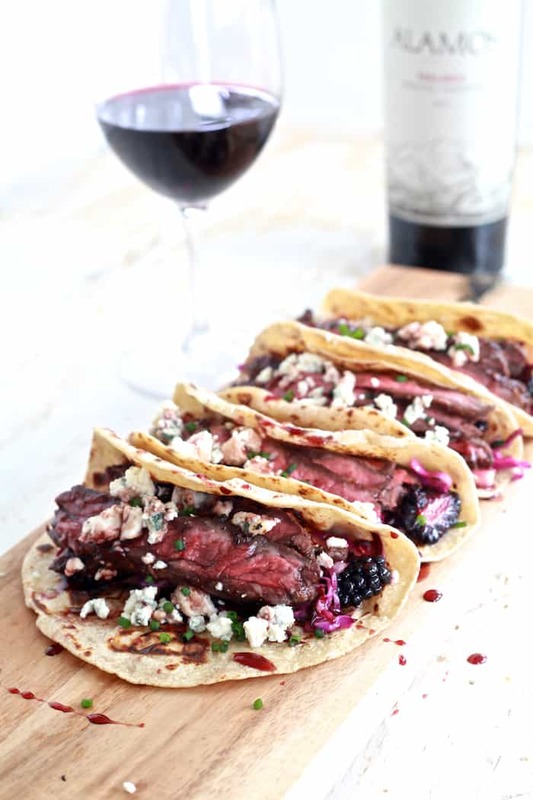 Gorgeous shots now I crave these skirt steak tacos for lunch. These tacos are seriously ah-maz-ing!!! All the way pinned. I have taco love and must try these. Wow! I’m seriously impressed with this flavor combo… so creative! And that steak is cooked so perfectly… I want these for breakfast (i.e. right now!). I don’t want to wait until dinner, these tacos look amazing! Love that dressing with Malbec. Great pairing! Pinned! Whoa. I am seriously drooling over these tacos. They look amazing. What a wonderful and creative combination of flavors!